Join Babes Around Denver for an enchanted and mythical evening in a magical fairy land at the largest Halloween party for women in Denver! 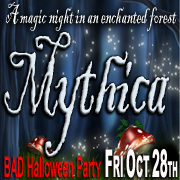 What does mythica mean?. Definitions include allegorical, chimerical, created, fabled, fabricated, fabulous, fairy-tale, false, fanciful, fantasy, fictitious, fictive, folkloric, imaginary, invented, legendary, made-up, mythologic, mythological, nonexistent, pretended, storied, supposititious, traditional, unreal, untrue, visionary, whimsical. Tracks will be transformed into a fairy land with castle and all. Get creative with your costumes ladies.